The transportation construction industry has a “once-in-a-generation” opportunity in 2017 to boost federal infrastructure investment and the next six months will be critical to getting it done, ARTBA President Pete Ruane said during a Jan. 31 speech at the National Asphalt Pavement Association’s (NAPA) Annual Meeting. More than 900 asphalt industry professionals gathered in Orlando for the event. House Speaker Paul Ryan (R-Wis.) and Senate Majority Leader Mitch McConnell (D-Ky.) have included an infrastructure package as part of their 2017 legislative agenda, following repeated calls from President Trump. But a great deal of work is ahead, Ruane said. While the president and his team have talked a lot about infrastructure and his campaign issued calls for both a $1 trillion and $550 billion package, they also have other early competing priorities such as repealing the Affordable Care Act, tax reform and a Supreme Court nominee. The challenge resides in not only ensuring infrastructure remains on the agenda of the president—and congressional leadership—but that it is also done right. ARTBA believes any final infrastructure measure should include both robust direct federal investment—with a permanent Highway Trust Fund fix as a foundation—and project financing mechanisms. 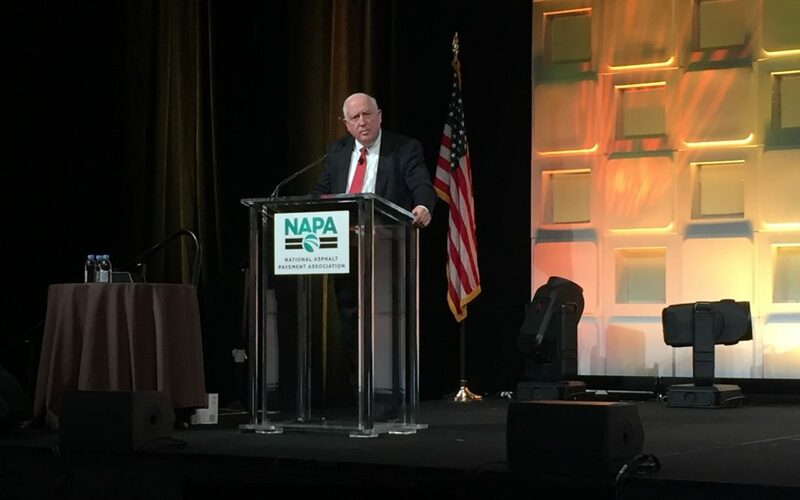 Ruane told NAPA members their charge is to reach out personally to their senators and representatives, remind them they did not fix the trust fund with the 2015 passage of the FAST Act, and urge them to do so this year as part of any tax reform plan that emerges.